I am coming to the end of my visit to Joigny, the town where our founder Sophie Barat spent the first sixteen years of her life. It was my fourth visit, and my first one for thirteen years, so there's been a blend of newness and familiarity, of memories and friendships. For just over 120 years the Society has owned Sophie's family home plus the adjoining houses, and the Centre Sophie Barat is now a small but thriving retreat centre, and a welcoming, homely place for all sorts of meetings and workshops. 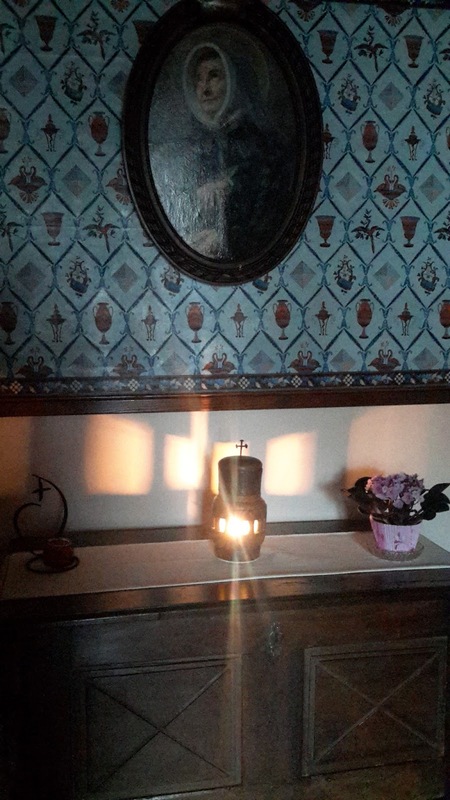 Sophie's house contains the reception - the place of welcome - and a sacred heritage centre, full of Society treasures. Sophie's bedroom is a small oratory, a place of stillness, saturated with the prayers of countless RSCJ and others, over which hovers the presence and stillness of Sophie herself. 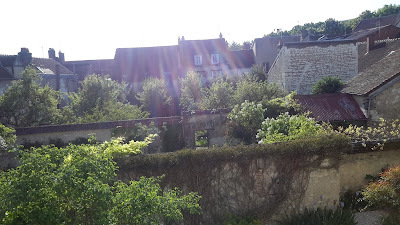 I sat here for hours, but I also spent time enjoying the garden in late spring sunshine, walking about the town, visiting her parish church and other familiar places and climbing up, up into the vineyards. I came in order to spend a few days chez Sophie - to be in Sophie's home. But praying up in the vineyards, looking down on the rooftops below, I knew that I was also, very much, chez moi - simply at home. This was partly thanks to the warmth and kindness of the RSCJ community, some already known to me, a couple of them strangers - but all my sisters. But deeper than that I felt a sense of rootedness; a quiet, soothing grace of stability and belonging. At home, deeply so; at home with Sophie and with God, in the Society of his Heart.